India is a vast country, and is full of influences of many foreign as well as indigenous cultures. These influences are very well noticeable in the food of India. The food from different parts of the country are so different that even Indians from all parts of the country do not like food from another part of the country. The advantage of this is the wide variety you get to taste in a single country. It is impossible to try the cuisine from all parts of the country, so it is better to take a state-wise approach. If you are interested in finding some good soul food then the north Indian states would be a good place to start. If you are into good seafood, then the coastal cities would be a fine choice. The eastern states have a patent on delicious desserts and the delta region has arguably the best Biriyani. However, if you are really interested in Indian food, and want to find out the best balance of spices and simplicity, then Rajasthan is where you should be. Rajasthani cooking style can be termed as traditional, since they still rely on combative way of leading life has shaped their cooking style. Another important factor, due to the lack of accessibility to major food items, Rajasthani dishes are mostly made from what they can cultivate in and around the region. If we go back to the old times, it is said that Rajasthani food did not require any heating for many days, and people could consume that without risks. Definitely we can’t think about having stale food, but in those days they did not have any choice. With water problem and green vegetables along with other ingredients, there is a great impact on Rajasthani cuisine. For instance, in places like Bikaner, Jaisalmer and Barmer people tend to use least amount of water and instead they prefer buttermilk, butter and milk. All this instantaneously changes the taste of the dish and makes it healthier. Rajasthan has some of the best Royal palaces in India and it is also known as “state of the princes”, with royal past it can be understood that there were Royal cooks and grand recipes were invented. Rajasthan culture and cuisine both has a great deal of influence due to its geographical location. It is not only hot and humid but extensively dry with little amount of vegetables to be found. Apart from vegetable dishes, there are various other meat dishes which are quiet special in Rajasthan. Culture wise, Rajasthan can be called a Hindu State and this is the reason why, you will find a wide variety of vegetable dishes. 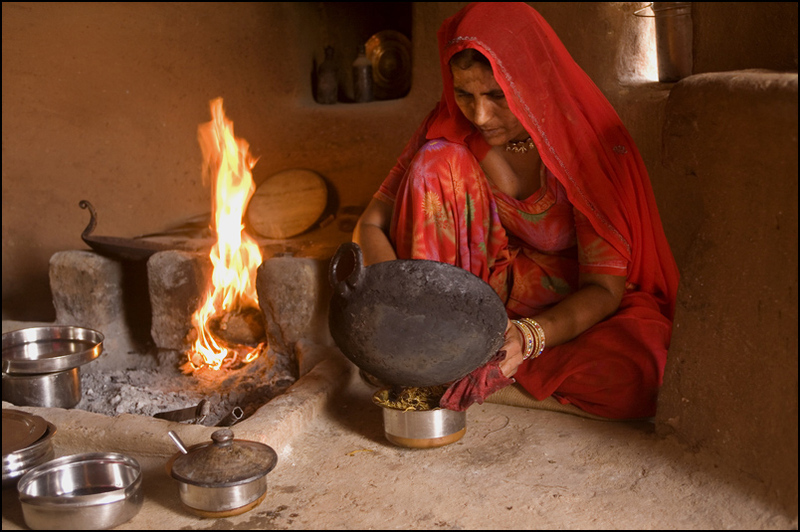 In Rajasthan region you will come across a wide variety of technique being implemented in cooking the food. Generally the dishes are spicy and mostly vegetarian; here are some names of cuisine, Laal Maas (red meat), a thali, this is the rajasthani style of eating. At times the food consists of 10 types of dish with variety of vegetables, sweets and chapatti, rice etc. You will find this special snack in Rajasthan, which is called Farsan but this is also widely enjoyed by people of Mumbai, Gujarat etc. Almost in all the dishes, you will get the taste of dry coconuts mostly and food items are rich and tastes tangy with red chilies, vinegar, the food items tastes superb. If you are unaware about the staple food items of Rajasthan, then read- it consists of lentils, red chilies in dried form, gram flour, corn, nuts, sugar and yoghurt etc. For cooking purpose, they use oil derived from sunflower, ghee, peanut oil, and canola. But on the contrary, you will find dried chilies, sesame seeds, fish, coconut, vinegar, nuts, pork and other types of meats as well, and these are considered to be the vital spice and ingredients used in Rajasthani Cooking. The first thing you need to know about Rajasthani cooking is that there are sub-genres of cooking style within Rajasthan as well. Different parts of the state specialize in different dishes. While you will find the staple dishes and some of the famous dishes in almost all the parts, there are subtle variations in these dishes as well. There are other dishes that you will find in a specific part of Rajasthani only, or that part specializes in making that dish. The variety of dishes that you can find in Rajasthan can be judged from all the different kinds of rotis you can find there. The most basic roti, made from ground flour, is common in all parts of India. Rotis are made from different materials like bajra, makai etc. There are variations based on how the roti is made as well. Khoba roti, for example, is given the name because of its unique texture, as ‘khoba’ in regional language means cavities or undulations. Missi ki roti, a famous traditional roti from Rajasthan, is made b adding meethi or coriander leaves to the basic roti. Besides roti, there are two close cousins of roti, known as puri and paratha. They are made from even a wider variety of ingredients. Aloo or potato, gobi or cauliflower, matar or peas and paneer are some of the basic fillings used in a puri or paratha. Rice is not a part of the staple diet, as rice grows in abundance of water. In Rajasthan, one of the varieties of roti, puri or paratha, or the famous dal bati is served with side dishes. The side dishes consists of one dish of some lentils or some form of vegetable curry, one side of meat, and a gracious amount of ghee or butter. And a sweet dish is also customary with every meal in Rajasthan. This is the basic outline of a proper Rajasthani meal. But on the contrary, you will find dried chilies, sesame seeds, fish, coconut, vinegar, nuts, pork and other types of meats as well, and these are considered to be the vital spice and ingredients used in Rajasthani Cooking. So you can see the variety of spics is the key factor in bringing diversity in Rajasthani cooking. It is a desert area, so getting hold of good fresh green vegetables can be hard. That is why Rajasthani cuisine contains very high protein diets. Meat is a common item in every day routine in Rajasthan. Another important factor is the scarcity of water, which is important for making almost all the dishes. Although water cannot replaced by anything as an ingredient in cooking, very often in Rajasthan milk or yoghurt is used as a base for cooking several dishes. Despite being a desert area, cattle rearing are a common practice in Rajasthan, and therefore, getting hold of milk is no problem. That is why you would find not only sweet dishes and curries, but most of the meat dishes as well use milk as one of the main ingredients. How Can You Forget The Sweets of Rajasthan? If you happen to be a sweet lover, then Rajasthan won’t let you down because they have incredible variety of sweets. In general the sweets are more preferable after the meal but you can have it in your comfortable way. That is why in Rajasthan, sweets are not termed as desserts. It is evident from the warm welcome and gratitude shown by Rajasthani people, whenever there is a guest, proper is served. And they are so much conscious that, they do not let the guest to serve themselves. But instead food is presented in an organized way for the guest, so that they don’t have to indulge in self-help, this is the kind of love and hospitality shown by Rajasthani people. This is basically a lentil dish. Besan, which is a form of grounded lentil or dal, is mixed with vegetables such as onions, tomatoes, yogurt and garlic. But the besan is kept in its steamed form for its unique taste. The dish has a number of different unique ingredients that you have to use, most of which are very common is Rajasthani cuisines. The use of ghee, especially is pretty prominent in all Rajasthani dishes. This is a spicy, dry dish that is conventionally eaten with the home made varieties of bread. 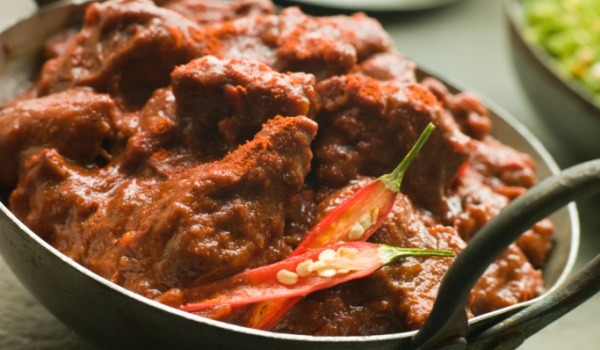 The name translates to Red Meat, not because lamb or pork is used to make the dish but because of the rich concentration of red chilies used to make the dish rendering the curry a bright red color. In a mostly vegetarian cuisine, there are only a few meat dishes, and almost all of them are famous. This one is a must have once you are in Rajasthani, although you might have a hard time digesting it if you are not used to eating spices. This is a type of Rajasthani Biriyani which is known to be cooked directly from Royal kitchen during the festivals. While Biriyani is conventionally a Middle Eastern dish, a good few variations are popular in India as well. The Hydrabadi variation which is a bit sour in taste, the Kolkata variation with potatoes and the Jodhpuri variation are all pretty famous. In this dish, you will find the use of Khus Khus, which is not used to make Biriyani in other parts of the country. It is a wonderfully delicious and filling dish. This is one of the most famous food item and dish unique to Rajasthan. This dish contains the following three ingredients, Baati (whole wheat roll which is very hard and looks like an upturned bowl, known as Baati in the local language), cooked in tandoor style. It is dipped in ghee (it can be butter as well), dal (light curry with lentils) and lastly churma (Baati is crushed and mixed with sugar as well as ghee). The word choorma literally means to crush. Choorma is a crushed sweet dish that is served with Dal and Baati. 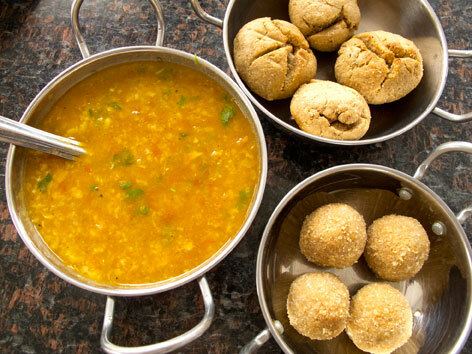 So to eat this dish, you need to crush the Baati into small pieces, pour the dal or lentil curry onto it along with a good spoonful of ghee, and then silently enjoy the bliss of Rajasthani cuisine. It is undoubtedly one of the trademark dishes of Rajasthan and a must try once you visit this wonderful state. This is considered to be the perfect meal for Maharajas and every non-vegetarian would love this dish. Since most of the dish uses milk and spice, for cooking this meat milk is used along with spices to give it a juicy taste. It also comes with thick gravy and the flavors that you may taste would be cardamom, khus-khus. Maas or maans in Rajasthani means meat, and most of the conventional Rajasthani meat dishes end with the suffix maas. A subtle variation of this dish, known as Safed Maas, where curd is used in place of milk to give it a slight sour taste, is yet another famous Rajasthani dish. Lamb or chicken is prepared with spices and rice in a simple way but the essence of spice and fresh green vegetables, makes the dish taste heavenly. There is another way for having the chicken or lamb, by grilling it in flat stones and it is placed on burning embers. These are just basic idea about cooking method but to understand the reality, you must visit once to taste the foods. There are various ways of cooking the food depending on food items to be cooked. Tandoor is a common cooking practice in Rajasthan. There is a mud oven, but it is not like the traditional mud ovens. In the traditional mud ovens that are used in rural areas of not only Rajasthan but in other parts of India as well, the food is cooked in utensils placed on top of the mud oven. The mud oven is short and is filled with coal, charcoal or timber which is used as fuel. However, in a tandoor, the mud oven is a lot longer and broader. The food is not cooked in any utensil but directly inside the oven. When meat is cooked, it is placed directly on the burning coal, for a grilled effect. When rotis are made in tandoor, they are stuck to the sides of the oven on the inside. It is a pretty common and very interesting cooking method of Rajasthan. Another important thing to note is the problem of storing cooked food. It is an acute problem in the rural areas of Rajasthan, where technological advancement is still sometimes concerned to be a taboo, or there is no access to basic modern amenities like electricity. For that reason, food which requires no heating, that is, does not actually has to be “cooked” is often prepared. This involves mixtures of different elements, such as variations of salads and dry snacks is very common in Rajasthan. Also, uncooked food such as snacks and dry mixtures can last longer without being spoilt. In order to prepare the Rajasthani Food items, one does not need any special equipment to cook the food. Simple and basic cooking equipments would help to prepare the dish. Using wooden stirrers instead of stainless steel is preferable. But to cook the dish perfectly you need to have experience for doing that, it is not at all easy to be successful with the first attempt. The bread, chapattis and rotis are made in the tawa which is a traditional way of making them in Rajasthan. Karai is used for cooking meat dishes and other than that, people are using grinder for crushing the spices and getting the desirable essence in the recipe. Using the electric gadgets for cooking is becoming popular in Rajasthan but to taste the authentic, you need to rely on the traditional ways. India is rich with culture, festivals and lastly its heritage and traditions. Interesting food festivals are a vital part in regions of Rajasthan. Special kinds of dishes are made during festive occasions and to be precise, Rajasthani people love to enjoy any occasion, with a great variety of food items celebrations becomes even more enjoyable. Rajasthani is well known across the world for its desert, forts, camels, cultures, people, and most importantly, its food. If you visit the state of Rajasthan and do not taste at least 10 new dishes then you have completely wasted your journey. You can even try and pickup a few recipes for back home; they are quite easy as well.